(MENAFN - DailyFX) Japanese Yen Talking Points The recent rally in USD/JPY appears to be sputtering ahead of the 2018-high (114.55) as the U. of Michigan Confidence survey does little to boost the economic outlook, and recent price action raises the risk for a larger pullback as the exchange rate fails to extend the series of higher highs & lows from earlier this week. 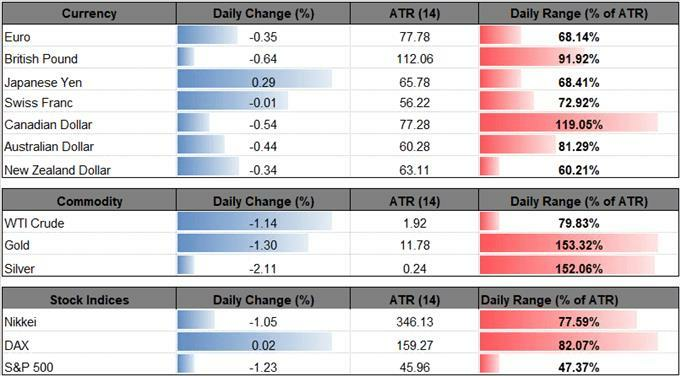 USD/JPY Bullish Sequence Fizzles as U. of Michigan Fails to Impress USD/JPY struggles to hold its ground as the U. of Michigan Confidence survey narrows for the second month, with the index slipping to 98.3 from 98.6 in October, and signs of waning household sentiment may push the Federal Reserve to soften the hawkish outlook for monetary policy as it dampens the outlook for private-sector consumption, one of the biggest drivers of growth. Nevertheless, key data prints on tap for the week ahead should keep the on track to implement higher borrowing-costs as the U.S. Consumer Price Index (CPI) is expected to climb to 2.5% from 2.2% per annum in September, while Retail Sales are projected to increase 0.6% in October after rising a marginal 0.1% the month prior. The shows 42.0% of traders are now net-long USD/JPY versus 52.1% last week, with the ratio of traders short to long at 1.38 to 1.The number of traders net-long is 2.0% higher than yesterday and 11.0% lower from last week, while the number of traders net-short is 17.0% higher than yesterday and 13.4% higher from last week. The flip in retail interest suggests traders are attempting to fade the recent advance in USD/JPY, and a further accumulation in net-short interest may provide a more meaningful contrarian view to crowd sentiment as similar themes materialized in September. With that said, the broader outlook for dollar-yen remains constructive as both price and the Relative Strength Index (RSI) track the upward trends from this year, but the lack of momentum to extend the series of higher highs & lows from earlier this week raises the risk for a short-term pullback. for an opportunity to discuss potential trade setups. Additional Trading Resources Are you looking to improve your trading approach? Review the ‘ ' series on how to effectively use leverage along with other best practices that any trader can follow. Want to know what other currency pairs the DailyFX team is watching? Download and review the for 2018.